Singapore, 28 July 2011 – While the overall configuration of the 23-turn, 5.073km Marina Bay Street Circuit will remain unchanged, the organisers of the 2011 FORMULA 1 SINGTEL SINGAPORE GRAND PRIX have agreed the following minor track changes with the Fédération Internationale de l'Automobile (FIA) ahead of the race on 25th September. In order to maintain optimum track condition, ahead of the race the Singapore Land Transport Authority will resurface Republic Boulevard; the run behind the pits to Turn 5, and Raffles Boulevard between Turns 5 and 7. 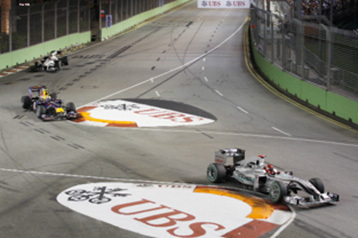 The track will also be resurfaced at Turn 20, the chicane just prior to the Singapore Flyer at the end of the lap. The Grand Prix organisers are also discussing the resurfacing of the Pit 'Fast Lane' to correct a small degree of differential settlement which has been noted between the fast and slow lanes in front of the pit garages. In response to a request from the FIA, the Turn 7 entry kerb located on Drivers' right will be replaced with a painted divider so that drivers are able to take alternate lines into Turn 7 to avoid bumps and possibly increase opportunities for overtaking. In addition, street kerbs in the runoff areas of Turn 7 and Turn 14 will be realigned. This will allow for minor realignments in the barriers that will provide approximately 1 to 2m additional runoff distance at the corners, providing a marginal improvement to drivers' safety. Turn 10 barriers are also being realigned at the request of the FIA to reduce the likelihood of a car that has lost control in the braking zone being launched over the chicane apex kerbs. This change in barrier alignment will not affect cornering speed at Turn 10, but the kerbs will be adjusted to a more gradual curve in order for the drivers to make safer exits from the corner. Following the successful use of the Trackjet® track-cleaning machine last year in removing dust, especially along the Pit Straight which is unused for most parts of the year, and improving the surface grip in key braking and acceleration zones throughout the track, the Trackjet system will be deployed once more this year. Mounted on a specially adapted truck, the Trackjet travels at 500m per hour and delivers water to the surface at 42,000psi through computer controlled jets to deep-clean and improve the texture of the track surface. Developed in Germany by Weigel Hochdrucktechnik GmbH, the Trackjet is also employed to clean runways at airports around the world. "Since the first race in 2008, the Marina Bay Street Circuit has consistently exceeded expectations around the world, but there are always things which we can improve" says Colin Syn, Deputy Chairman of Singapore GP Pte Ltd. "The minor modifications discussed with the FIA will ensure that we deliver even better racing for the fans as we look forward to fourth year of the FORMULA 1 SINGTEL SINGAPORE GRAND PRIX." In addition to the track changes, two important technical innovations to the cars racing in the 2011 Formula One World Championship are also set to add further to the night race spectacle. All the leading cars this season are employing KERS, Kinetic Energy Recovery System, a hybrid technology device that stores energy created by the car's braking process and allows it to be turned into power at the press of a button to boost acceleration. In addition 2011 has seen the debut of the DRS (Drag Reduction System) rear wing which has significantly increased the number of overtaking moves on track this season. DRS allows drivers to reduce drag and gain extra speed on the straight, but the system's availability is electronically governed and can only be activated to aid overtaking during the race, when it can only be activated when a driver is less than one second behind another car at a pre-determined section points on the track. The FIA will formally announce the approved 'DRS zones' shortly before the race.